The most important time to have a significant other is when you are sick. Yeah sure, it’s nice to have someone around when you’re healthy and having fun, but it’s not really vital. And it’s not like it’s vital that sick people have a significant other, all I’m saying is that it would be really helpful and appreciated to have someone around fetching things for me, kissing my forehead, cooking me soup, etc. I went to the Take Care center at Walgreens because I was afraid I had strep throat as the symptoms just sort of sprang on me in the middle of the night. The medical professionals were actually really chill and I’m glad I went there and not urgent care. I do not have strep, yay me. 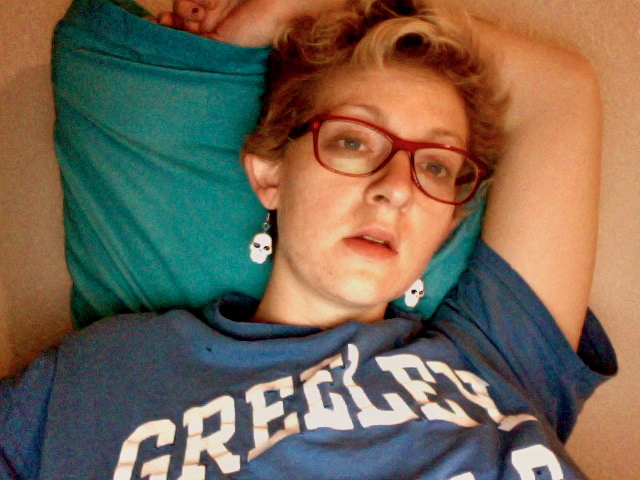 But I do now own this skeleton earrings. Bonus! How sick do I look? Ugh. This really puts a damper on my already lack-of-productivity. When I’m not being productive I’m usually as least doing something fun. Though I don’t know why I’m complaining about sleeping all day in between bouts of netflix. Probably because it hurts to do any of it. Mainly it hurts to talk, which is one reason why I’m yammering on via this blog. So yeah being sick makes me feel vulnerable and a little lonely. Slightly emotional, though I’m trying to avoid all of that by sleeping it off/out. I think I need to go for a walk. If I don’t I’ll just make myself feel even grosser by being in this bed like 30+ hours. Anyhoo. Such is the cycle of life. Wellness. Sickness. Alive. Dead. Things that happen in between.